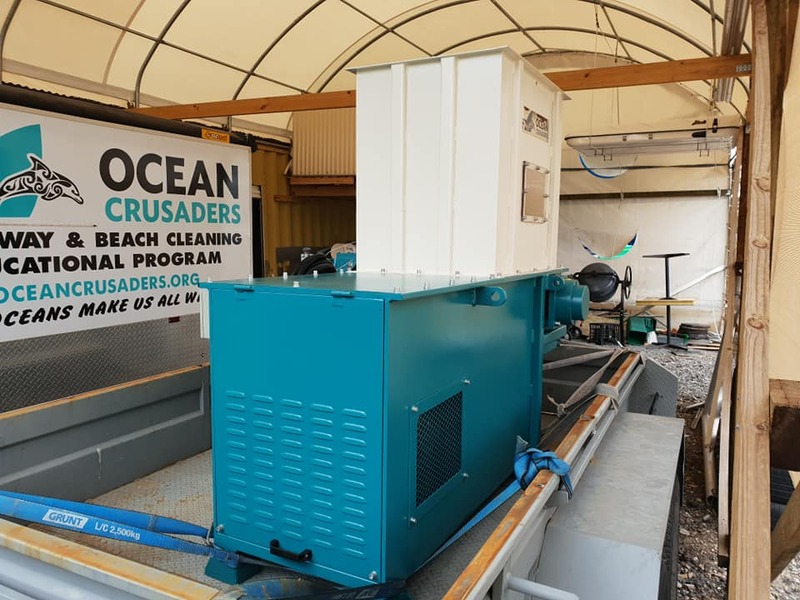 At Ocean Crusaders we have a fleet of vessels and vehicles to get the job done, no matter how big or how small. Salter is the pride of our fleet. Custom built for us, this 7m landing craft has the ability to carry large loads, has easy access with the bow door and twin engines to give it maneuverability and speed. When light she can travel at 27 knots, however more often she is crawling along banks, often with the vacuum onboard sucking up tonnes of debris. 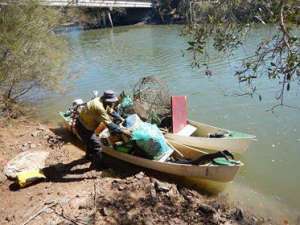 The boat is also trailerable and hence it goes all over the country. It has been as far south as Melbourne and in 2019 will go right up to Townsville. Spinnaker is a 5.4m ex-fisheries vessel. 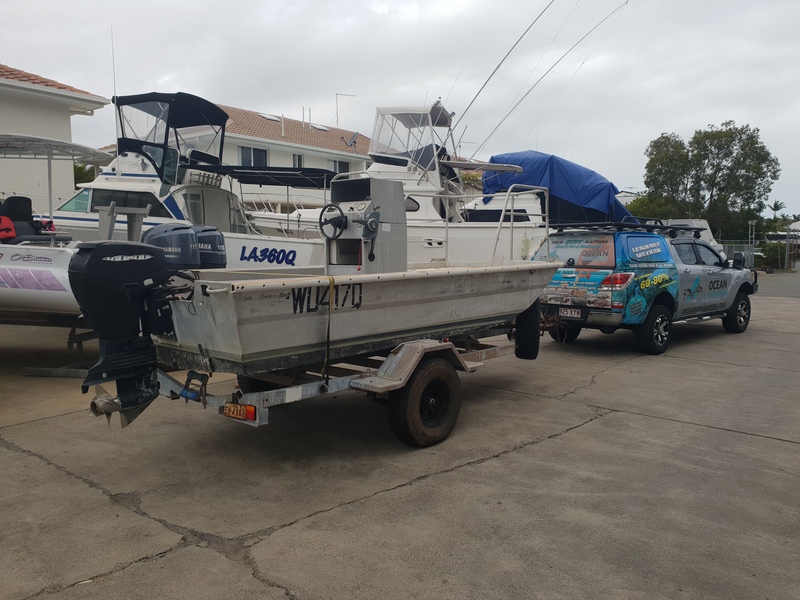 She was donated to us by Spinnaker Sound Marina and is a high speed shallow draft vessel for getting to the far reaches of rivers and to islands quickly. It also comes on an off-road trailer meaning we can take it to remote places and still access the water. Slogger is our original vessel and has earnt her keep well and truly. A shallow draft vessel she goes places a lot of boats can’t, yet is solid enough to cop a beating. 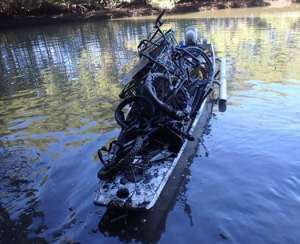 She is often seen on the Sunshine Coast waterways loaded in debris. 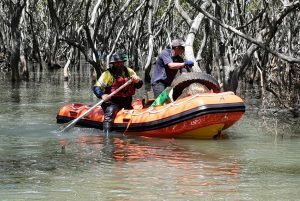 Sweeper is used during our Paddle Against Plastic events as a rescue craft, however she is also used to carrying debris. 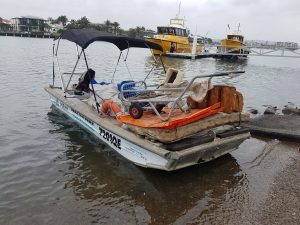 Donated by Construction People and Me Tender Boat, this is a 3.6m RIB built for offshore work. Mud Skipper is a specialised craft for accessing the upper reaches of estuaries where conventional vessels cannot go. 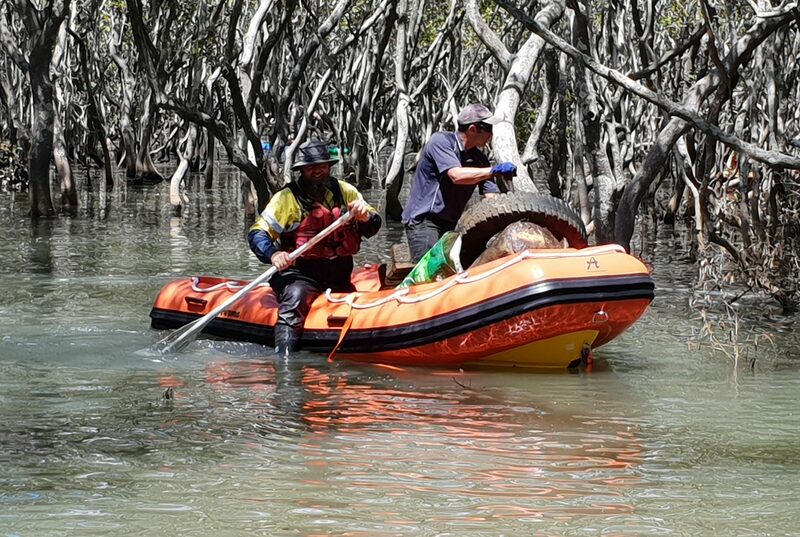 It’s super shallow draft and 1m width means she will wind her way between trees and can be carried over rocks. She also has outriggers for stability if required. She is also powered by an electric motor meaning she is quiet as she removes debris. Often used in conjunction with a larger vessel, she is part of the Mosquito Fleet, used for getting in and out quickly and returning items to an easier to access area. Mud Gudgeon is 2 Rosco Canoes strapped together providing a stable craft for shallow water access. Either paddle or electric outboard powered it is surprising just how much weight you can fit in this craft. 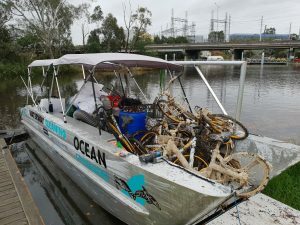 Usually seen with our Noosa Crew aboard, she is known to collect couches and fridges from places our boats can’t get and can take a crew of 4 if required. Easily launched even when there is no ramp, she is a major asset to our fleet. 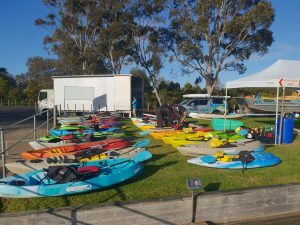 Our fleet of kayaks enables more people to clean at our community events. 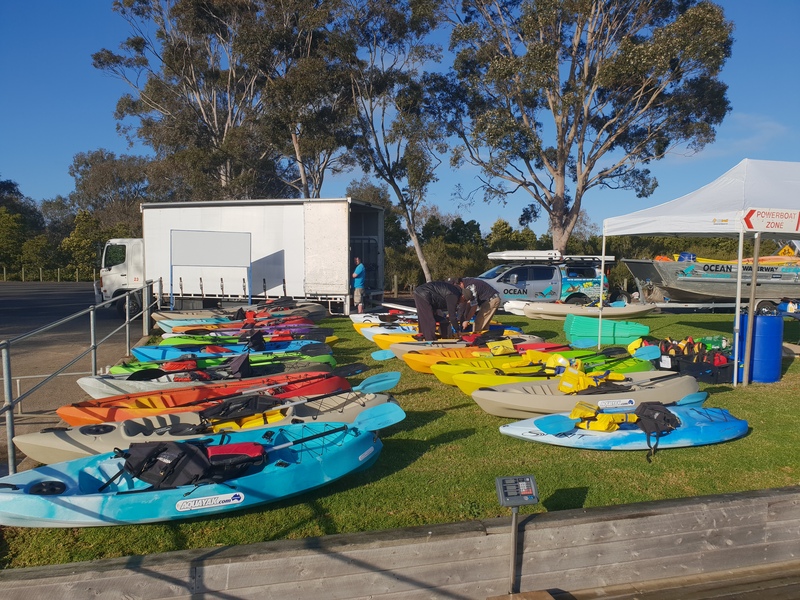 Courtesy of support from Aquayak Kayaks, our fleet consists of 4 doubles, 2 1+1’s, 7 singles and 5 children’s along with 7 kayak trailers to collect debris in. Our Hino 4×4 Crane truck can carry a huge load and remove larger items. 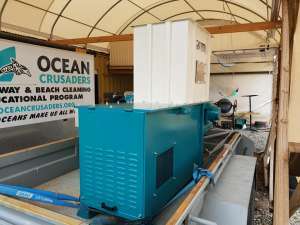 It is used to move equipment and debris all over the place. The crane can lift 2.7 tonne maximum and still lifts 400kg @11m. 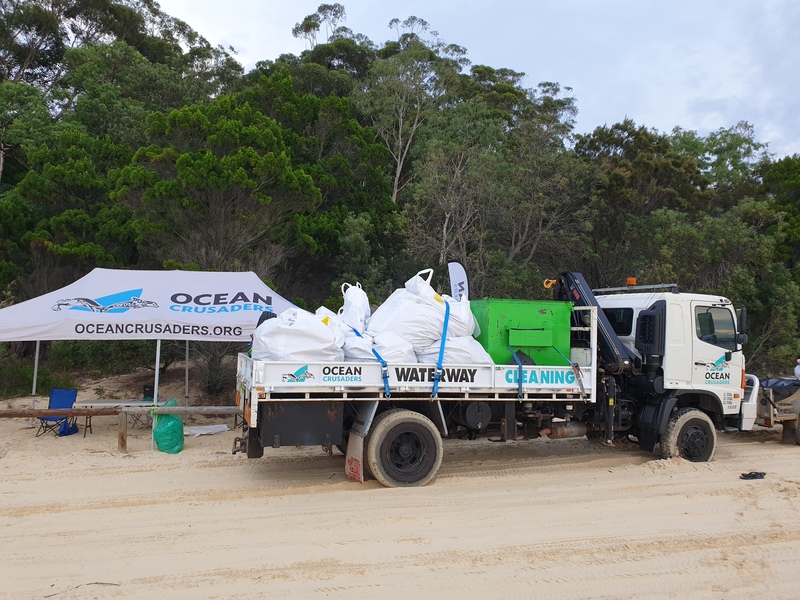 Being a 4×4 she can also access the beaches and remote areas Ocean Crusaders are renowned for going. She also has a 7m trailer that she can tow to ensure she gets everything that is needed to wherever it needs to go. Combined the trailer and truck can carry 12 tonne of equipment. 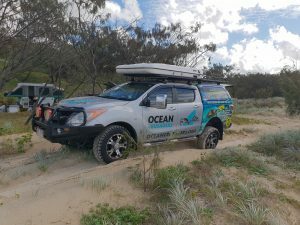 Our daily drive is our Mazda 4×4 Ute. 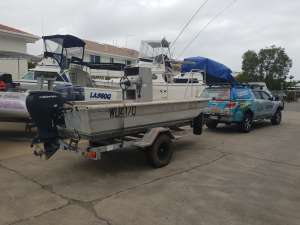 It can tow every boat, has full length roof racks and ample space in under the canopy. And it is also our billboard for messages we want to get out to the community. It is also ideal when we head to the beaches like Fraser & Moreton Island. Sick of seeing too much waste go to landfill, Shredder is designed to break hard plastics into 40mm flakes so we can bring more back and send off for re-purposing. Provided courtesy of a grant from the Queensland Government Gambling Community Benefit Fund.